Sri Lanka’s recent dealings with China offer a cautionary tale for many African countries. The way the island nation has ceded control of the strategic port of Hambantota highlights the issue of ‘debt-trap diplomacy’. It poses the question of whether developing countries are naively mortgaging their resources and strategic assets to China. Given Africa’s huge reliance on China as a source of funding, there is concern that African states will suffer a similar fate to Sri Lanka – and unwittingly become pawns in China’s global strategic agenda. It is important to recap what happened in Sri Lanka. Post-civil war Sri Lanka went on a borrowing binge to reconstruct dilapidated infrastructure. To successive Sri Lankan governments, China was a benevolent friend, offering cheap, easy and addictive money – an attractive alternative to the strict conditionality of Western financing arrangements. But the country soon ran into economic woes, and when the debt burden became untenable, the Sri Lankan government was forced to relinquish majority control over the port in 2017 in lieu of repayment. This sparked outrage across Sri Lanka. To critics, it was confirmation of China’s imperial agenda and demonstrated the pitfalls of Chinese financing: that despite a lack of explicit political conditionality, there is certainly ‘no free lunch’, and such arrangements pose a threat to the sovereignty of vulnerable countries. Many believe the Sri Lankan example demonstrates China’s unique form of ‘debt-trap diplomacy’ – a predatory system designed to ensnare countries into a straightjacket of debt servitude. Brahma Chellaney, in a 2017 article for Project Syndicate, explains that Chinese loans are collateralised by strategically important natural assets with high long-term value (even if they lack short-term commercial viability). The port of Hambantota, for example, straddles Indian Ocean trade routes linking Europe, Africa, and the Middle East to Asia. Typically, Chinese loans assume the form of ‘cash for resources’. In return for financing and building the infrastructure that poorer countries need, China demands favourable access to their natural assets, from mineral resources to ports. The recipient nations usually suffer from low credit ratings and have difficulty obtaining funding from the international financial market. China, however, makes financing relatively easily available – albeit with certain conditions and less ‘paperwork’ than conventional sources. China’s ‘tied aid’ for infrastructure usually benefits Chinese companies, while its loans are in many cases backed by natural resources. Through this method China achieves the twin goals of economic penetration and strategic leverage. In light of this trend, what is the nature of China’s engagement in Africa and will African countries suffer a similar fate to Sri Lanka? The question is especially relevant in light of China’s broad geopolitical ambitions. With the West in retreat and focusing on internal issues, China is asserting a more muscular approach across Africa. As Africa’s main trading partner since 2008, China is securing a long-term ‘foothold’, where it can do business and also ensure the security of its citizens and companies. Central to this approach is the One Belt, One Road initiative. China is expected to invest up to $1.3 trillion in infrastructure projects as part of a mammoth trade route across Asia, Europe and beyond. In Africa, the initiative will create the continent’s largest free-trade zone in the Horn, and should also include flagship projects like the East African Railway Master Plan. The tiny East African nation of Djibouti is at the core of this strategy. Beijing has taken root in Djibouti through numerous infrastructure projects including a new port, two new airports and the Ethiopia-Djibouti railway. The sheer scale of these projects, combined with the fact that they are concentrated in a small but strategically located, cash-strapped country, make China’s presence significant. Apart from being China’s first overseas military base, the Djibouti base represents the first pearl in China’s ‘String of Pearls’ (a theory regarding the country’s Indian Ocean ambitions) along the sea route connecting China to the Middle East. The strategic similarities to Sri Lanka are obvious. So what’s the problem? Africa has a substantial infrastructure deficit and if China can help bridge the gap, surely this should be celebrated rather than criticised? In theory, this makes sense, but practically, not quite. African countries do need investment; and substantial loans from China are helpful – but there is a catch. With narrow revenue bases and undiversified economies, there are doubts about whether these countries will be able to service debt, especially against a backdrop of weak commodity prices. Indeed, the Democratic Republic of the Congo (copper, cobalt), Zambia (copper) and Angola (oil) have recently experienced the negative consequences of this strategy. Mozambique, currently in the midst of a gas boom, should also be aware of the risks, given its elevated debt levels. In Djibouti, the situation is particularly alarming: ‘The debt with China increases exponentially. They are going to take this port, just like they did in Sri Lanka,’ Doualeh Egueh Ofleh, a deputy in the National Assembly with the opposition Movement for Democratic Renewal and Development told ISS Today this week. Many states would have to resort to payments ‘in kind’ – which effectively amounts to a country handing the asset back to China a la Sri Lanka. This has led to Beijing’s role in Africa being criticised by Western governments and some Africans as neo-colonial. However while there is a tendency to paint China’s financing as predatory, African political elites are also complicit, argues China-Africa expert Dr Lucy Corkin. Blaming China provides a convenient scapegoat but doesn’t absolve governments from brokering shoddy deals that don’t benefit their people. John Ashbourne, an Africa economist at Capital Economics, believes a disproportionate amount of attention is devoted to China’s model as it is newer and different to Western ones. He believes it’s unfair for African governments to claim victimhood given the range of financing arrangements available to them. Ultimately, the question for policy makers in Africa is whether they should adopt a more circumspect approach towards dealing with China. 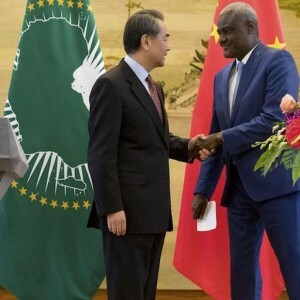 It is important to be aware of exploitative dangers associated with such arrangements, but it is also important to be strategic in how Chinese interest can be exploited to Africa’s advantage. Here a level of tactical nous and economic diplomacy are required. By exercising their agency and setting the terms of engagement, savvy countries could use China’s involvement in Africa to grow their economies. They could also solicit renewed interest from previously disengaged foreign powers by using their relationships with China to bolster their political capital. If this is done properly, they could avoid the fate that befell Sri Lanka – and even ensure African nations emerge as winners rather than losers.